Celeb Bingo Gets a Make-over | Win up to £200K! Celeb Bingo is no stranger to gossip and scandal, so rumourville has been sent into overdrive recently after the brand had a fresh make-over and star-studded revamp for 2015! 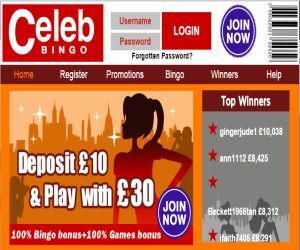 We're sure from the headlines that the are plenty of scandalous bonus and trend-setting surprises in store for players at Celeb Bingo, which are sure to keep avid fans locked at the reels. The site boasts an indulgent Welcome bonus where you can make a first deposit of £10 to give you a starry £20 and help you start your glamorous adventure with £30. You'll then still be able to high-roll like a celebrity through a glamorous selection of 90 Ball, 75 Ball and High-Five Bingo hits to rack up your riches! Celeb bingo is another site to jump on the 200K Jackpot bandwagon, which will be happening on the 25th September in the Special Jackpot room. For just £1 a ticket, you can play to win your own life changing moment and grab a share of the £200K prize pool. You can also play daily games to win Free Spins or join the monthly 2 Million Race to go into a prize draw where 40 winners can collect a star-studded 2 Million Loyalty Points! There is also a 100% games bonus and 100% bingo bonus in store! So make sure you roll over to Celeb bingo so catch your share of the celeb winning action! Just watch out for the paparazzi!